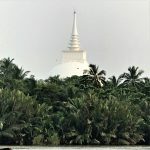 This tropical island of coconut palm fringed beaches has many things to offer, but most importantly it is the home to Buddha’s teachings (Dharma). The Dharma was brought to Sri Lanka by Arahat Mahinda, son of Emperor Asoka of India, in the 3rd Century BC. The Theravada form of Buddhism became firmly established and has thrived ever since. 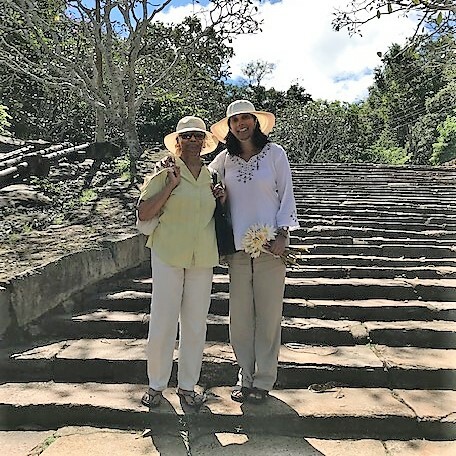 In visiting Sri Lanka I am returning to the birthplace of my parents who first taught me the Dharma. White domed stupas and temples abound on this tiny island where 72 per cent of the population is Buddhist. 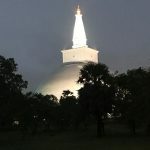 Today I am going to visit the ancient Buddhist city of Anuradhapura in the Northeast of Sri Lanka. 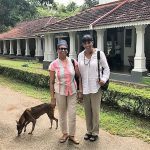 My auntie and I board the train at Mount Lavinia, by the sea, at 5am. I’m looking forward to seeing the countryside. 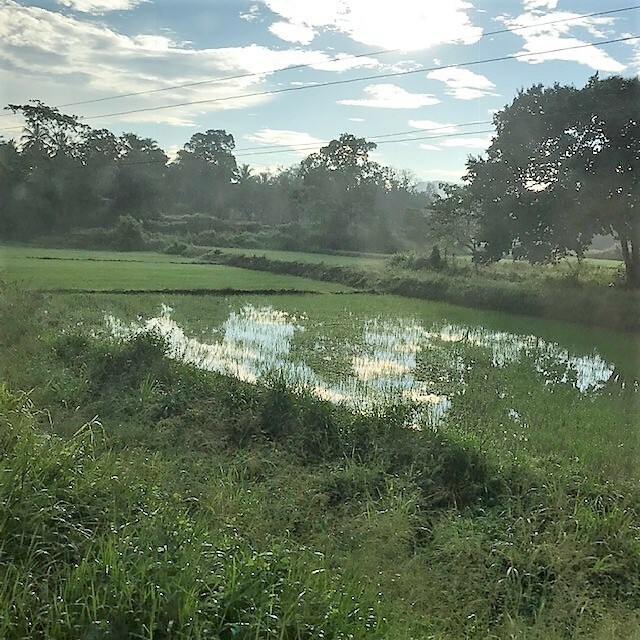 The last time I went on the train here I was nine years old and as the palm trees and paddy fields flash past I discover the thrill is still there. I marvel once more at the lush, green vegetation of the countryside. According to Karma Thinley Rinpoche, the Tibetans say that the rivers in Sri Lanka are filled with pearls and all the women are Dakinis (spiritually advanced)! There are many things to see at Anuradhapura and I wondered how we would do this. 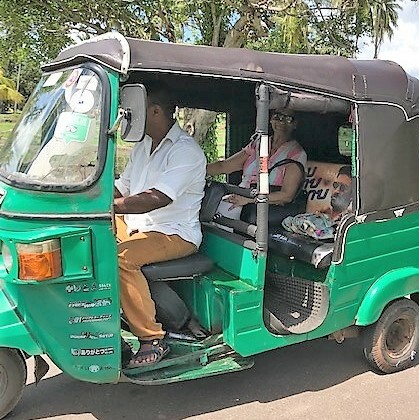 However, when we arrive at the station we meet a helpful tuktuk driver, Sugath, who offered to take us round the sites. This ancient sacred city dates back to the 2nd century BC and was the site of several large Buddhist monasteries. 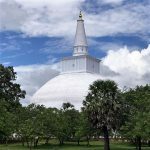 The famous Ruwanwelisaya was a large white Stupa built by the Dharma King Dutugemunu in 140 BC. The white hemispherical dome shines brightly against the blue sky and is famed for the perfection of its architecture. The story of its construction is very inspiring with all the gold, silver and precious gems being provided by the King of the Gods in a day. The Stupa contains relics of the Buddha and, as in Kathmandu, Buddhists come to make offerings to the Stupa and recite prayers. 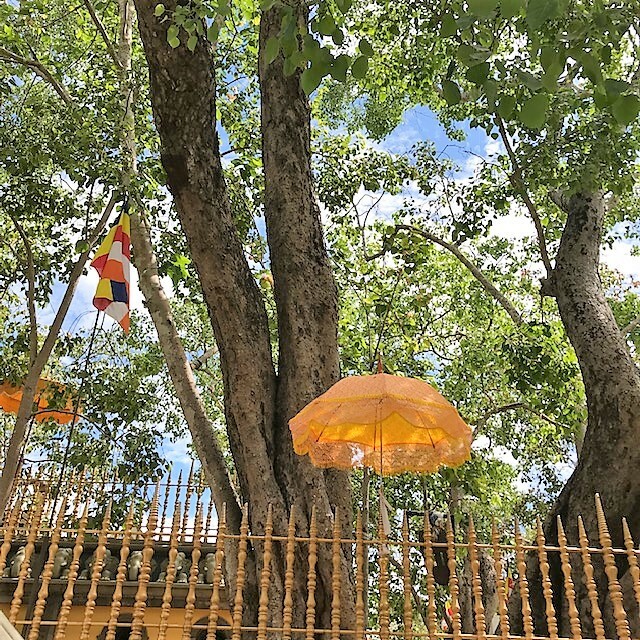 We visit the Sri Maha Bodhi tree nearby, which came from a sapling of the original tree in Bodh Gaya, under which Buddha attained enlightenment. 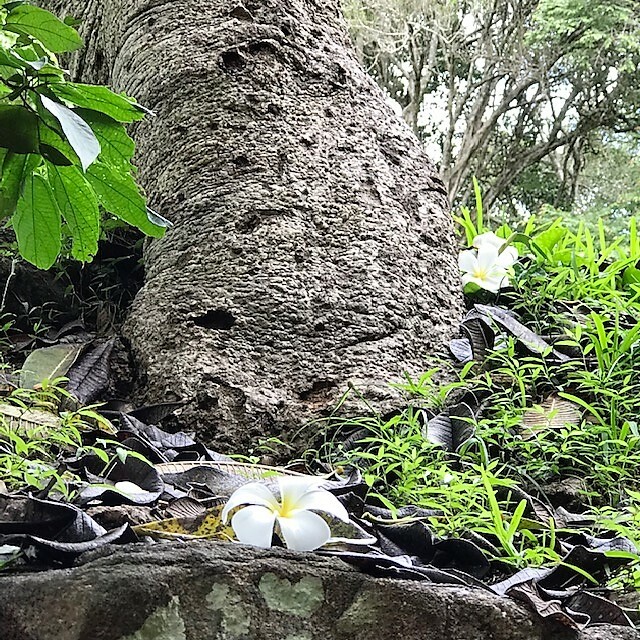 The sapling was first brought to Sri Lanka by Sanghamitta, daughter of the Indian Emperor Ashoka and was planted in 288 BC, making it the oldest living tree. Sanghamitta was herself a nun and subsequently ordained the first Buddhist nuns in Sri Lanka. Anuradhapura had several large monasteries and one of these, Abayagiri, had both Theravada and Mahayana monks. Vajrayana was also practised. 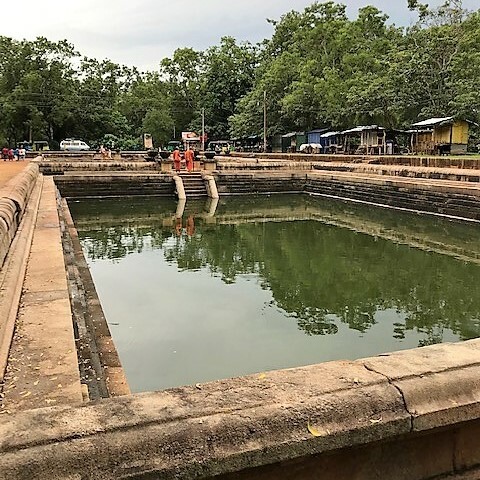 It was interesting to see evidence of two tanks beside one another, large enough for the 5000 Abayagiri monks to bathe in. 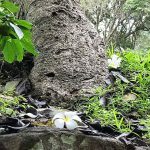 There was a natural water filter and irrigation system which was ingenious. There was also a refectory with a stone juicer and a long rectangular stone receptacle for rice, so they appear to have been well looked after! We also visit the Vessagiriya cave temple, built by King Devanampiyatissa over 2300 years ago for the monks. At the time there was a shrine room, meditation area, refectory and stupa. There are still depressions visible in the rock where the monks meditated. 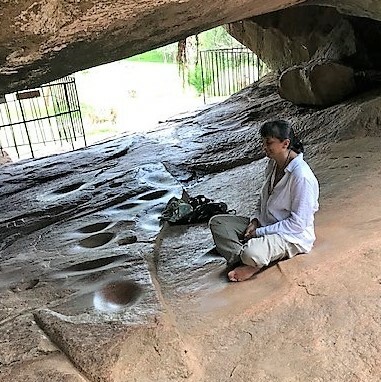 I am getting used to sitting in caves by now so I take the opportunity to try one out! For lunch Sugath takes us to a friend of his who very quickly makes some delicious vegetable coconut rotis, using minimal equipment. 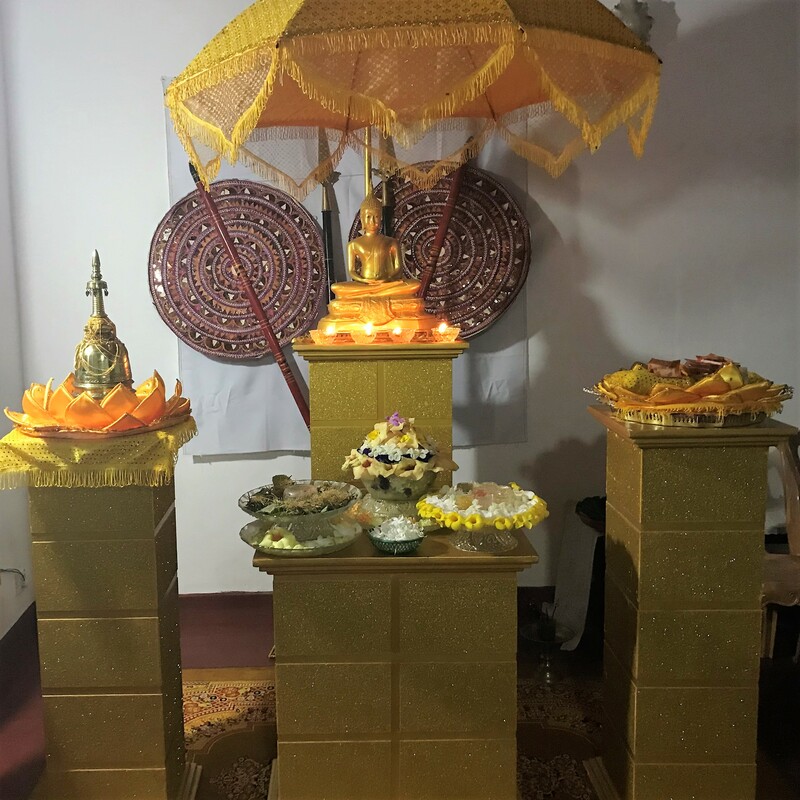 Later on in the evening, my auntie and I go back to the Ruwanwelisaya Stupa to make offerings and to sponsor lighting of the Stupa on behalf of our parents. It is raining heavily and several dogs are asleep in the butter lamp room where they have taken shelter. Despite the rain, the Stupa looks amazing set against the night sky. The next morning and we’ve arranged for our tuktuk driver to take us to Mihintale. Here King Devanampiyatissa first met Arahat Mahinda, son of King Asoka, and received Dharma teachings which made him the first Buddhist in Sri Lanka. They met under a mango tree where it is said that Arahat Mahinda questioned the King to see if he would be able to understand the Dharma. There are over a thousand broad steps to the temple complex at the top of the hill. I was able to buy a couple of hats from a local stall to protect us from the heat of the sun. Along the way we saw some beautiful creamy Araliya flowers which are often used as offerings. My auntie told me that the house in Colombo where my father was brought up was called ‘ Temple Villa’ due to the large Araliya trees there. 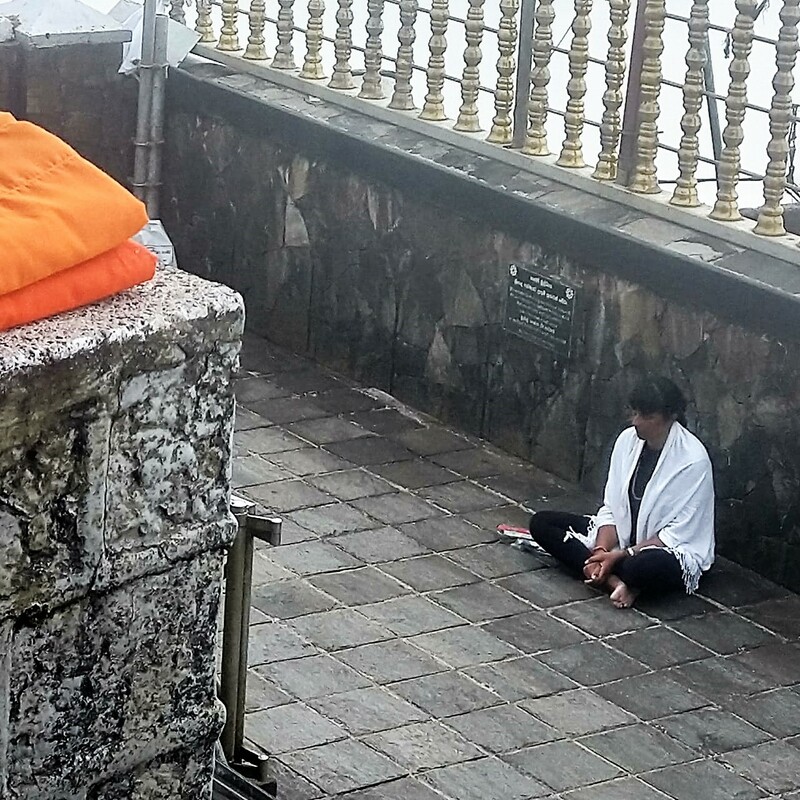 It’s a popular place for Buddhist pilgrims and the final steps to the top are quite steep. 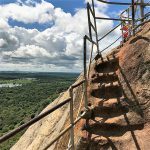 I passed families with small children and more elderly relatives all gamely clambering to the top. 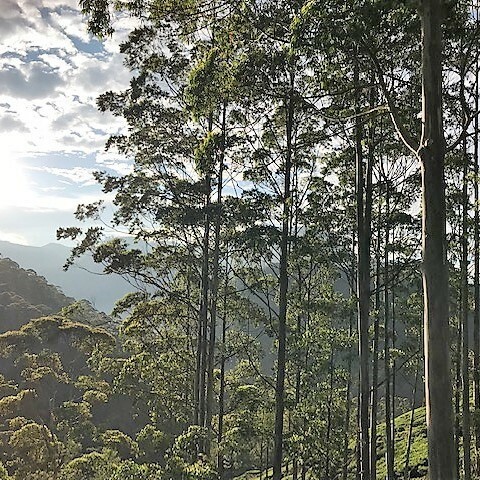 The panoramic views from the top are quite spectacular. Whilst in Kathmandu, Karma Thinley Rinpoche spoke to me about the sacred mountain of Sri Pada, the place where the Buddha left his footprint on his third visit to Sri Lanka. He told me that Guru Rinpoche had also visited Sri Pada and taught the Vajrayana (a tantric form of Buddhism) there so of course I wanted to go! It’s a very popular pilgrimage place in Sri Lanka and my father did the climb when he was a young man, along with some friends. My cousin Manouri who I am staying with was also keen to make the trip and spoke to a family cousin Asela who arranges treks. Being a pilgrimage and also because it was off season and this was our first visit, there were initially some doubts about whether or not the trip would be possible. He came round to see us and finally it was agreed that we would go on the last Thursday of November, which is the full moon day of Poson and also a bank holiday. 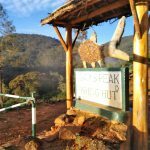 The local God of the mountain is called Sumana Saman and we had to agree to be vegetarian with no eggs for the week prior to the trip. 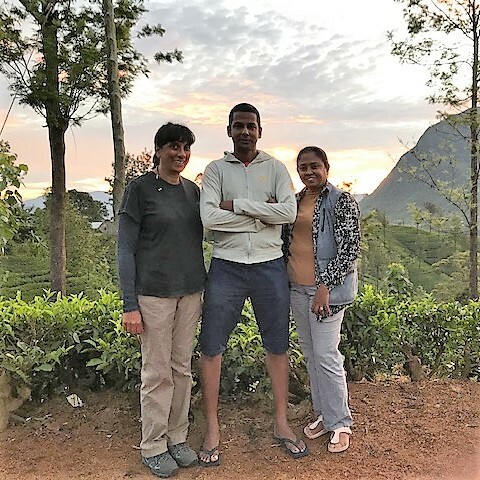 We had a vehicle and were joined by some of Asela’s friends, including Manju who is one of Sri Lanka’s foremost inventors and research scientists. 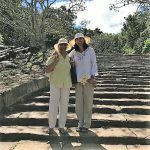 While I was in Anuradhapura they visited a nearby temple to do a puja for Sumana Saman to request his protection for a safe ascent. Being the monsoon season there was a high chance of rain making conditions potentially challenging. 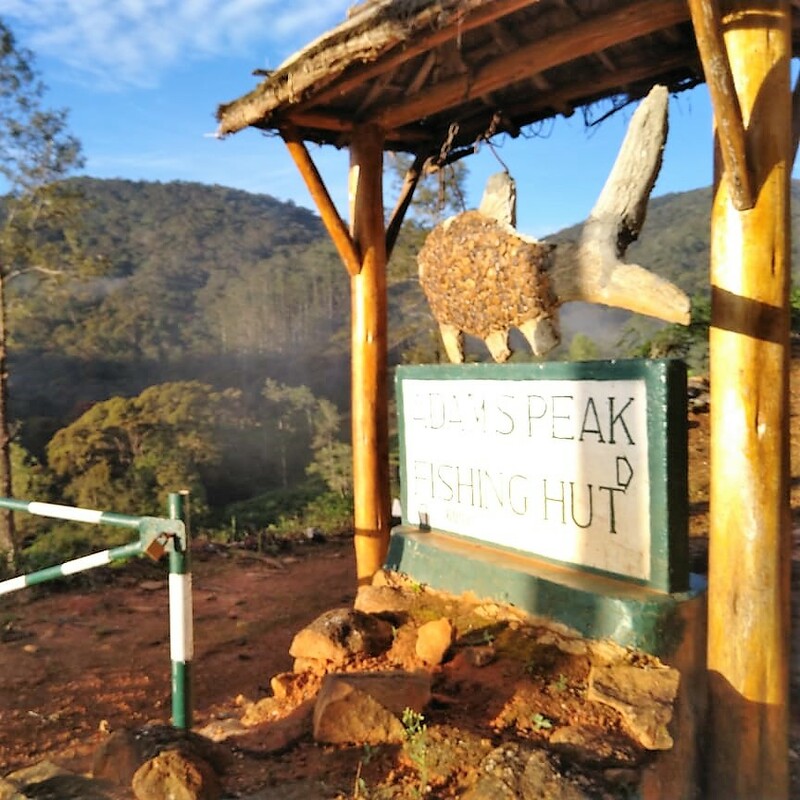 We set off at midnight to make the 5 hour journey to The fishing hut, our starting point in the hills. We arrived at dawn in time to see the sunrise over the hills. As we set off through the forest we soon encountered an onslaught of leeches. These tiny stick like insects were jumping onto my walking boots and forward flipped upwards. Fortunately I had worn my boots but for those with more exposed feet, the leeches had a field day. The salt packs worked very well, but they were certainly persistent! Fortunately once we reached the steps, the leeches abated. The usual route during the season consists of thousands of rocky steps which are usually filled with a chain of pilgrims right up to the top. As it was off season we took a different route through the forest and joined the steps half way. Asoka, Manouri’s husband, subsequently told me this was a very unusual route which most people don’t do and had only been open since 2015. 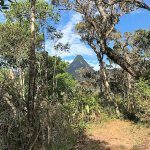 We met very few people along the way and enjoyed spectacular views. 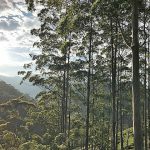 Hatton, in the central district of Nuwara Eliya has amazing forests of tall eucalyptus and a variety of teak trees, among others. This area of biodiversity has been recognised as a World heritage site by UNESCO, along with seven other areas including Anuradhapura. As we continued to climb, the peak of Sri Pada came clearly into view. The peak is over 7000ft and it’s a strenuous climb. 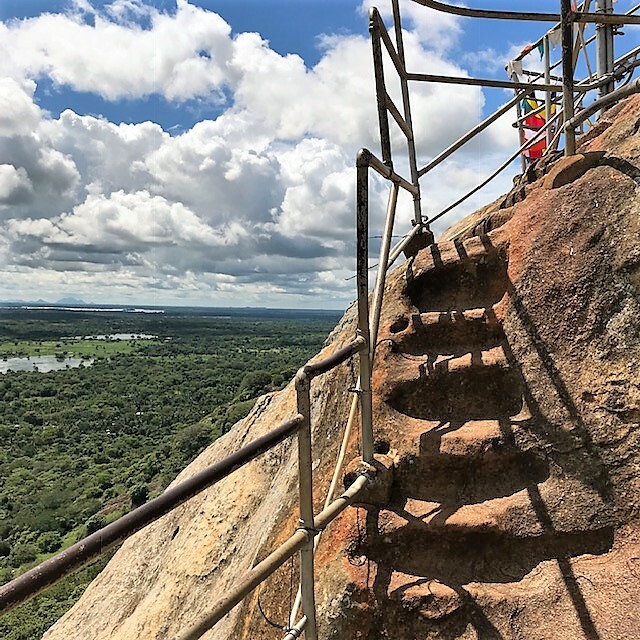 Previous Sinhala kings have made the ascent and even Marco Polo, it seems. We had glorious views of Castlereagh on the way up, a reservoir of turquoise blue coloured water. When we finally reached the top we made offerings and sat for a while to meditate. There was a large bell to ring, for those who had made the climb for the first time. Then it was time to descend down the rocky steps which seemed to go on forever. Every time I thought we were nearly there, I turned the corner to find another flight! We finally got back to the van 11 hours after we started and the rain descended. 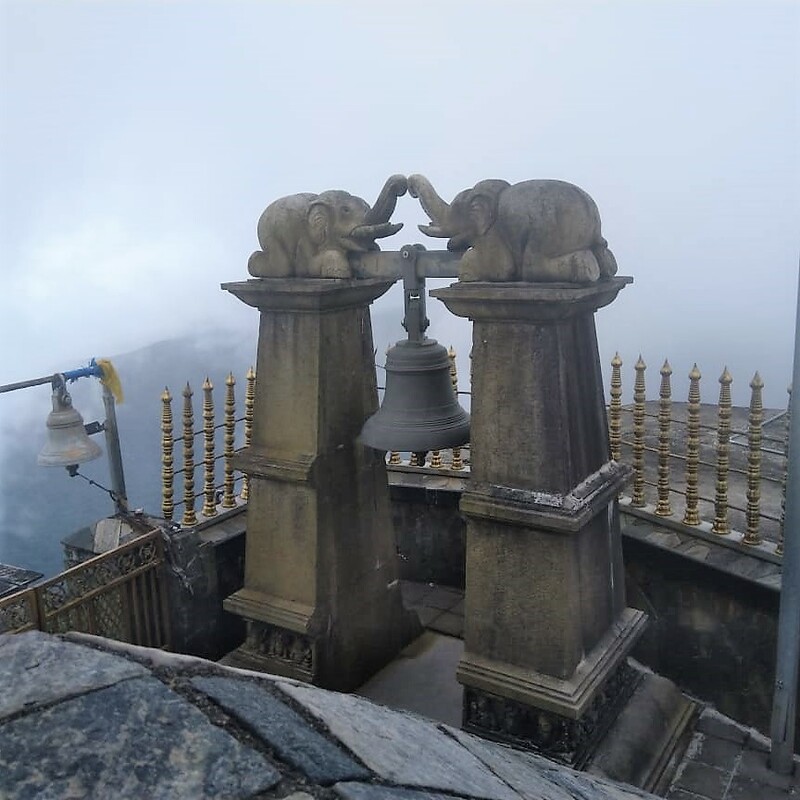 Everyone said we had been extremely fortunate with the weather, or perhaps the prayers to Sumana Saman had worked. It had certainly been a memorable journey. 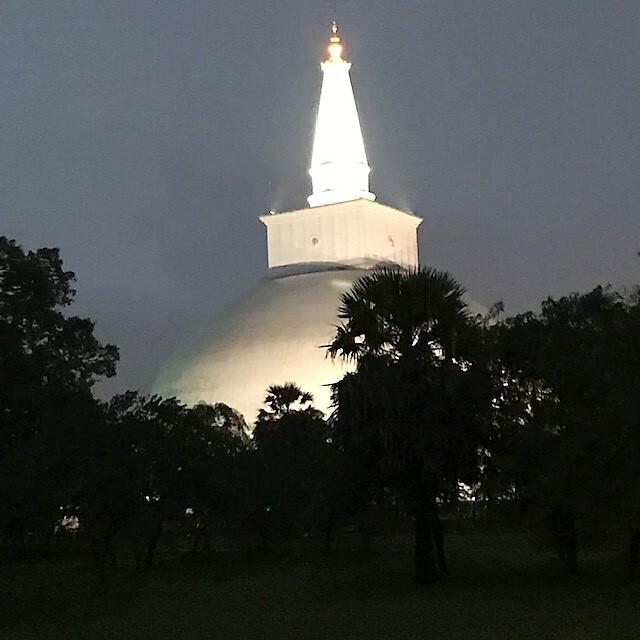 It’s been great to return to Sri Lanka, the land of my origins and where Buddhism has been firmly established for many centuries. Despite the political shenanigans, there is strong faith in the Buddha’s teachings and he is regarded with great reverence. Shrines to Lord Buddha are frequently passed on the roadside and temples and beautiful white stupas abound. 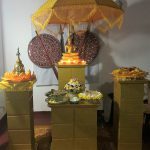 In daily life too, many people attend the temples to make offerings to the Buddha, stupas (representation of the Buddha’s mind), the numerous Bodhi trees and the monks. The sounds of pirith chanting (the words of Buddha) are often heard in the mornings either on the radio or outside. Every month the full moon day is a public holiday so that people can go to the temple. 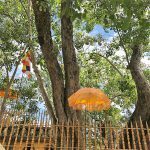 I was happy to see the dharma being kept alive in my family and was fortunate to be able to attend a Dana where monks were invited home for offerings to be made and merit was dedicated to deceased relatives. 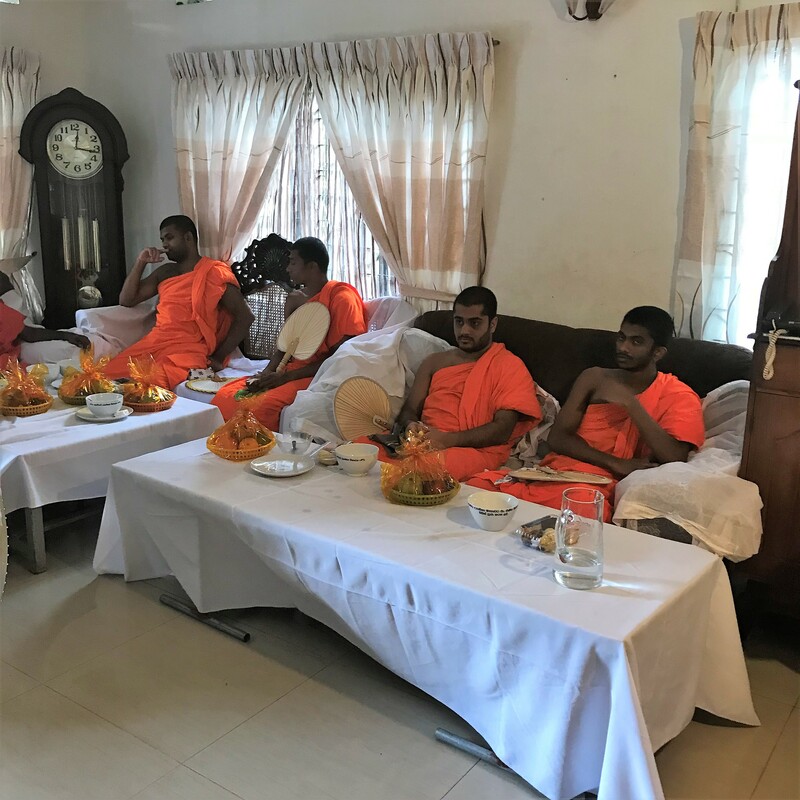 The monks brought the Buddha’s relic casket and a special robe offered by the lay people to the monks during the ceremony of Kathina, to a neighbour’s house while I was visiting my cousin Saman and his family in Panadura which is south of Colombo. We were all invited to participate and receive blessings. They lived literally around the corner and I found it amazing that they were able to share the dharma in this way with their neighbours. 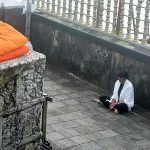 During Kathina, the lay people look after the monks for the months of the rainy season as, during this period, they are unable to go out and collect alms as they traditionally used to do. 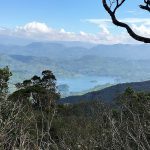 I enjoyed the richness and diversity of Sri Lanka despite it’s small size but now it’s time to return back to chillier climes. However it’s great that in England, as well as further afield, the pure dharma teachings including the path of meditation and wisdom is there for those who are interested. Through the transmission of Mahayana and Vajrayana teachings by Karma Thinley Rinpoche and Lama Jampa Thaye, the path to wisdom and compassion is being made available to all and I feel very fortunate to be a part of that. It will be great to attend the Shedra (series of teachings) this weekend in Manchester and hear Lama Jampa explain the path from beginner to an enlightened being as explained in the ‘ Jewel Ornament of Liberation’ by Gampopa, one of the great forefathers of the Karma Kagyu lineage.